If you are more like a hands-on person, you should consider becoming a welder. It’s an absolutely rewarding and exciting career. 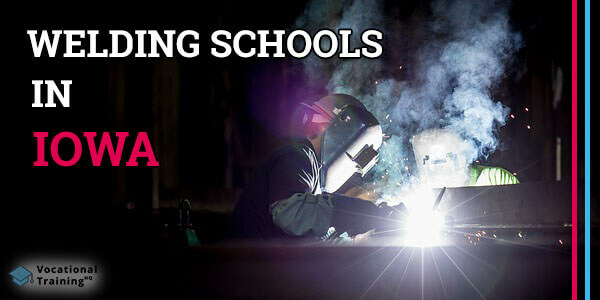 In this article, there is a list of the best schools where you can get your welding training in Iowa. Also, the article contains some significant info about duties, career options and salary of a welder in Iowa. 4 Where Can Certified Welders Work in Iowa? Welders use numerous tools in order to join metal pieces together. To do it properly, they need to be skillful enough to use various tools. These tools are used to heat, melt and connect metal elements. If you still aren’t sure whether it’s a good idea to become a welder, you should that it’s a rewarding career. You’ll be able to work on important projects and be proud of your work. Buildings, bridges and other construction created by your hands will be throughout your city. Also, keep in mind, that welding outlook is really big and it still growing. According to the data provided by the U.S. Bureau of Labor Statistics, it will grow by 6% by 2026. Working as a welder in Iowa, you can earn a median salary of $37 190 per year which is $17,88 per hour. In fact, a median salary throughout the country is slightly bigger. It’s about $39,390 per year ($18.94 per hour). Speaking of the top 10% of welders in Iowa, their median average salary is about $49,740 annually. At the same time, the top 10% of welders throughout the country earn about $62,100 per year. Where Can Certified Welders Work in Iowa? Want to know where you can start your career as a welder in Iowa? To become a professional welder, you need to get proper training that’s why we created this list of the best welding schools in Iowa. You should know that each school from the list was certified by the American Welding Society’s SENSE Accreditation Program. Regardless of your choice, you can be sure that each program has such important classes as Gas Tungsten Arc Welding (TIG), Shielded Metal Arc Welding (stick), or Gas Metal Arc Welding (MIG). Those students who decided to participate in any program should have their high-school diploma or GED. Keep in mind, that in some cases it’s enough to be a high-school junior. Of course, there are some other careers that will be a perfect choice for people who like working with their own hands.